The Safety Centre now has a selection of Fire Alarm System Contractor Kits available. 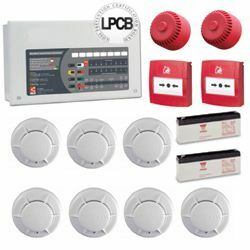 These kits are ideal for Fire Alarm Contractors as they provide everything for a complete system and can be easily built upon to encompass larger projects. Our friendly sales team will be happy to advise which Fire Alarm Contractors Kit is right for your project and be able to assist with further equipment if needed. The Safety Centre’s Fire Alarm Contractor’s Kit start from as little as £234.95 ex VAT. Call our team today on 01200 428410 or email sales@thesafetycentre.co.uk for further information. If you enjoyed reading this, you may also be interested in Temporary Fire Alarm Systems or Fire Alarm Cable.